As pristine as it would have been when it left the Hohner factory in 1971 — together with the built-in combo amp and stompbox effects. Arturia’s new V Collection 6 includes a digital tribute to possibly the funkiest of all keyboards — the Clavinet. 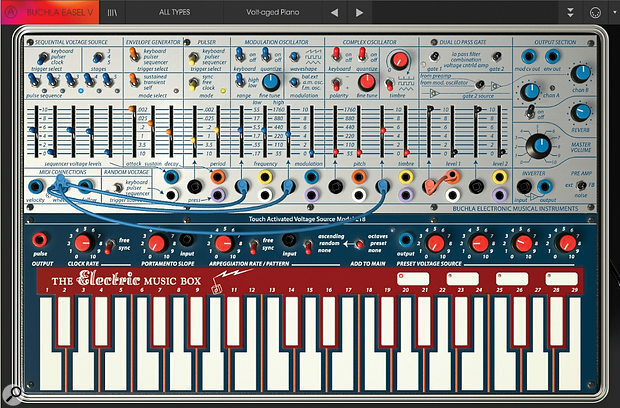 Arturia’s V Collection suite is in its sixth revision, now with a total of 20 virtual recreations of classic synths and electro-mechanical instruments (see 'V Collection 6' box later). This review focuses on one of the collection’s newest members, Clavinet V, a recreation of an iconic keyboard whose popularity has endured for nearly six decades. It would be unusual to find a keyboard player who was not aware of the Hohner Clavinet, the ‘funk machine’ that forged the groove of many funk, jazz fusion, rock and soul tracks since the 1960s. The first model to be introduced was the Clavinet I in 1964, followed by the II, L, C, D6, E7, and finally the Pianet/Clavinet Duo in 1982. Arturia’s Clavinet V is modelled upon the D6, widely held to be the pinnacle of the Claviverse. Contrary to popular folklore, Stevie Wonder’s ‘Superstition’ was played on the 1968 model C, not the D6 as often cited. 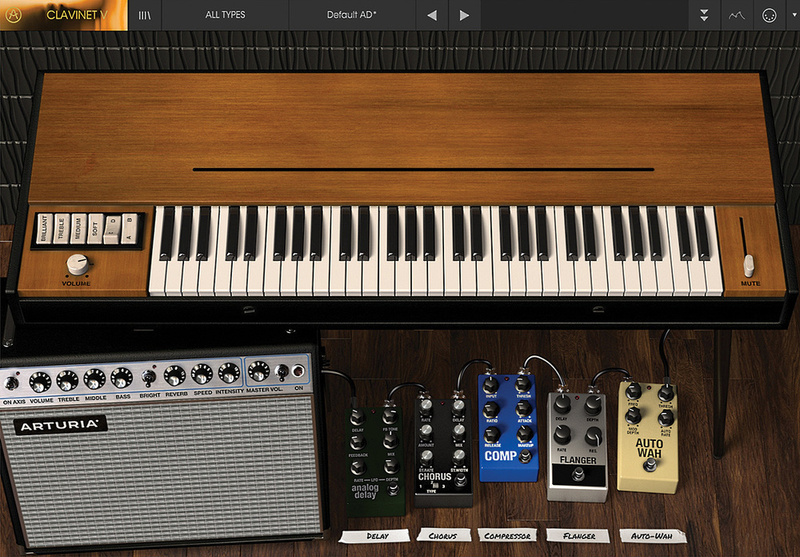 Clavinet V’s GUI sets the scene with a photo-real image of a D6, accompanied by a combo amp and five stompbox effects (shown above). This D6 is depicted in showroom condition — not a coffee cup ring or unsightly burn mark to be seen — but let’s just pretend this is 1971, the D6 has just rolled off the production line and the gigging hasn’t yet started. One could also be a teensy bit picky and point out that the keys should have rounded waterfall fronts, but that would be super nerdy so I won’t mention it. Like all recent Arturia GUIs, this can be resized from 60 percent up to 200 percent with no artifacts, keeping everyone from tablet users to those with obscenely large monitors happy. The six rocker switches, volume knob and mute slider are exactly as you’d find on the real thing; we’ll skip the amp sim and stompboxes for now, and look at the ‘raw’ instrument. Firstly, the two rightmost rocker switches labelled A/B and C/D control how the Clavinet’s two humbucking pickups (modelled ones, in this case) are combined: A+C activates the lower pickup only, B+C is the upper pickup, A+D combines both pickups in phase, and B+D puts both pickups out of phase. The differences in tone are quite dramatic, and indeed these were the only tone controls available on the Clavinet models I, II, L and C.
The D6 expands on this with four EQ switches: Soft, Medium, Treble and Brilliant. As with the real instrument, at least one of these must be selected to get any sound at all. Clavinet V’s Mute slider accurately models the behaviour of a real Clav, where damping is applied progressively as the slider is moved upwards until the sound becomes a short ‘pizzicato’ pluck. This has the advantage over sampled Clavinets, which simply switch between damped and undamped sample sets. As a departure from the original’s 60-note F to E range, Clavinet V covers the full 88-note range of a piano, allowing you to reach bass notes you always wished you could on the original, down to a belching bottom A. It also responds to sustain pedal messages, an additional ‘off-piste’ feature aficionados might opt to ignore as Clavinets have no sustain pedal. I prefer to kick mine well out of the way. Click on the lid and it flips open, revealing an unfeasibly clean and tidy interior (my Clavs were very adept at collecting fluff and dead flies). A grey panel pops up from the compartment where the Clavinet’s legs would normally be stored; here we find eight knobs for making custom tweaks to the model. Adjustments to the String Resonance, Dynamics and Hammer Hardness in particular contribute greatly to the apparent age and condition of the instrument. No flies in this interior — opening the lid reveals controls for altering the apparent age and condition of the instrument. String Resonance controls not only how long the strings will ring, but also how the higher harmonics decay relative to the whole sound. At its maximum position the sound has an artificially long decay, retaining its high harmonics for most of the duration; at the 12 o’clock position the sound evolves (devolves?) in a very natural way, whilst at the minimum setting it begins to resemble the Mute fader at around its halfway position. Hammer Hardness affects the overall harmonic content, the timbral variation of which is highly dependent on the Dynamics (velocity to volume) setting. Hammer Noise is a key-on effect, best described as a microphonic ‘thump’ transmitted through the soundboard to the pickups. Removing the noise altogether sounds unnaturally clean, whilst a setting of between 1/2 and 2/3 adds this subtle but essential mechanical realism. Release Time and Key Release Noise control two more subtle but important details: Release Time emulates the condition of the layers of wool woven (plaited, if you will) around one end of the strings, damping them when keys are released. In time, the wool goes a bit frizzy and becomes slightly loose, so doesn’t damp the strings quite as efficiently as it used to. This is most noticeable on the lowest strings, and Clavinet V gets this spot on when the release time is set high — even down to the slight downturn in pitch when a key is released. The effect of Key Release Noise becomes progressively more apparent as you go higher up the keyboard, particularly when playing staccato notes. Rather like the key-off version of Hammer Noise, it’s a short microphonic soundboard resonance — take it away altogether and you’ll miss out on an essential mechanical characteristic. The preamps in Clavinets are notorious for being noisy, especially when running on a weak battery. The misleadingly titled Pickup Noise parameter offers control of its level, from full-on hiss to squeaky clean. A little does help to set the scene, but if you really want to simulate that ageing PP9 battery, crank it up and go for it. The final parameter is Tuning, covering a range of 400 to 480 Hz. Adjacent to the eight knobs is a drop-down menu titled Harmonic Profile; there are six options — Default (natural), Boosted 2nd and 3rd, Soft, Soft Boosted, Dark and Bass Guitar, the last of which may be intended to represent the theoretical sound of a Clavinet fitted with strings of heavier gauges. The most dramatic variation here is the Dark profile, which sounds very much like the 2nd harmonic percussion drawbar of a Hammond with a long decay and a pronounced key click. Clavinet presets have been prevalent on synths ever since presets became a thing, suggesting that it’s a relatively simple sound to simulate. Whilst some examples are perfectly good sounds in their own right, few if any pass close inspection. So does Clavinet V do a good job at capturing the true character, and would it fool Penn and Teller? I don’t know about them, but I’d have to say yes, it does an astonishingly good job. Having been the owner of two D6s for nearly 40 years, playing Clavinet V feels like connecting with an old friend. I would have difficulty in reliably identifying it versus a well-maintained example of the real thing in a double-blind listening test, which is the highest praise I can offer. The only appreciable difference (thankfully) is that the hammers of this modelled version are in ‘new’ condition, unlike the ones in my D6s that eventually softened in later life and developed grooves that trapped the strings, causing loud clicks and pops when keys were released. For that classic Clav sound, an amp and a clutch of effect pedals is a must, so Clavinet V obliges with the necessary accessories built in. Based on what appears to be a Fender combo, the amp model extends Clavinet V’s onboard tone shaping with treble, middle and bass tone controls, preamp volume, a Bright switch, and a choice of on- or off-axis mic positions. No self-respecting combo would be without a spring reverb simulation and tremolo, and indeed they’re here to complete the picture. The five stompbox effects come before the amp in the signal chain. Each slot always contains an effect, and these can be one of eight different types: Flanger, Phaser, Chorus, Delay, Compressor, Overdrive and Vocal Filter. The eighth effect, Wah, is permanently present at the front of the effects chain in slot 1 — its position cannot be changed, whereas effects in slots 2 to 5 can be in whatever order you choose. Two types of Wah are available: Auto Wah, which responds to dynamics and includes an LFO for cyclic effects, and a Cry Baby-style foot pedal. Unlike all the other effects, the foot pedal Wah inexplicably has no bypass switch, so once selected, it’s permanently engaged. The Chorus and Phaser benefit from stereo outputs as long as the amp (which is mono) is bypassed, otherwise they are summed to mono. The Chorus is especially well-specified, with three chorus types and what appears to be independent mono and stereo choruses that can be combined at different rates and depths. I couldn’t exactly recreate the classic Roland Jazz Chorus or Boss CE-1 Chorus Ensemble sound favoured by many Clav players of yesteryear, nevertheless it has a unique and pleasing character of its own. Sounding rather like a hybrid phaser and wah-wah, this unusual effect complements Clavinet V very well. The Vowel circles can be repositioned in any order — the closer to the centre circle they are, the stronger their influence.The Vocal Filter is especially interesting, and an inspired choice of effect for this instrument. Essentially, an LFO cycles around five vowels: A, E, I, O and U. These are arranged on a small screen in a circle, and can be dragged around into any position. The closer a vowel is to the centre of the circle, the stronger its influence; increasing the size of the circle adjusts the overall depth. Resonance adjusts the vowels’ bandwidth, with higher values giving a sharper effect. The LFO rate ranges from almost stationary to dizzyingly fast — the small switch at the top stops it altogether, and the rotating ‘puck’ can then be pointed at the vowel of choice and left there. The cycling effect really suits the Clav to a ‘T’. This and a splash of Chorus and I could play it for hours. 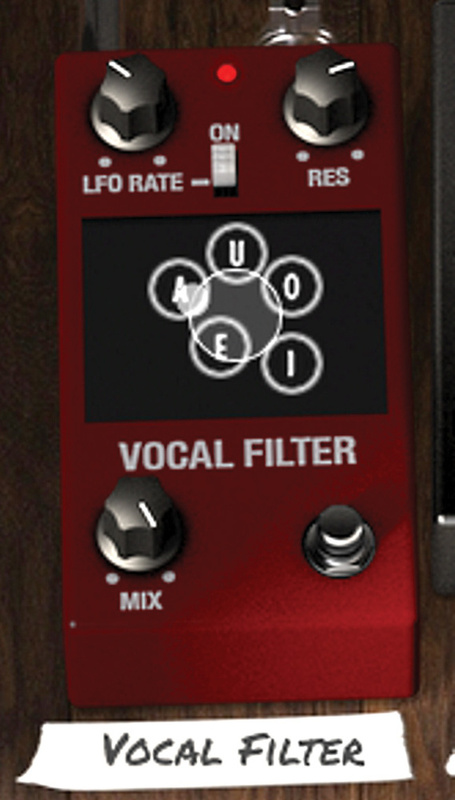 Combining multiple effects such as these: Compressor > Overdrive > Chorus > Vocal Filter, transforms Clavinet V into a bass/power chord/lead monster that could easily pass for a guitar. Loads of fun. Two reservations: none of the effects’ LFOs are tempo-sync’able, nor is the Delay’s time parameter. The Delay also suffers from a significant drop in volume when engaged, which creates problems if you need to turn it on and off during a performance. This could be avoided if there were separate dry and wet level controls, rather than the single Mix control. Hopefully, Arturia will address this issue in a future update. Clavinet V is an astonishingly accurate recreation of this iconic electro-mechanical instrument. Anyone familiar with playing the real thing will also know that the keyboard itself does much to encourage the typical playing style — lots of syncopation and snappy staccatos — owing to its light, shallow keyboard action. Playing Clavinet V using a MIDI keyboard with a very light synth action and shallow key travel will certainly enhance the playing experience. The Clavinet V isn’t the only new addition to the V Collection. Here’s a quick round-up of what else is new in version 6. 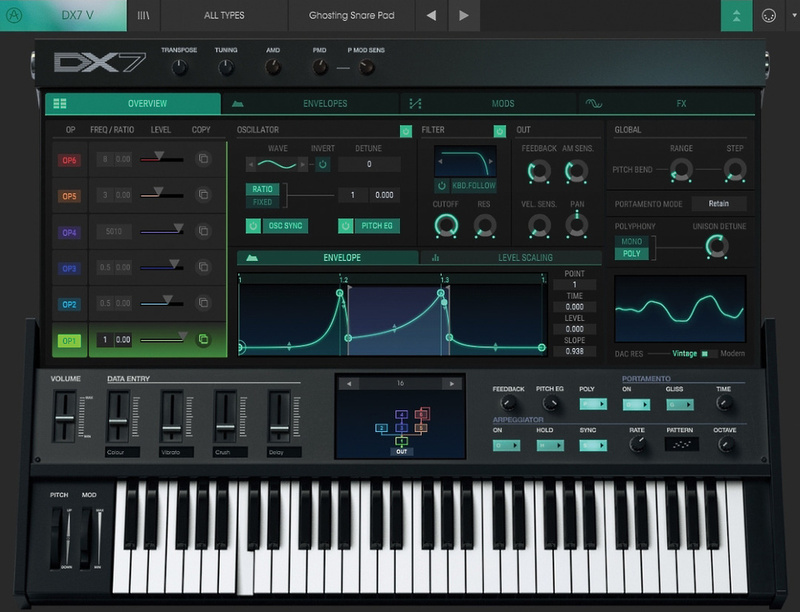 Although not unique in modelling the DX7’s FM synthesis in software, DX7 V approaches the task with an arguably more intuitive interface than its competitors, and expands on the original concept in numerous ways. Twenty-five waveforms are available per operator, including the sine wave used by the original instrument. Each operator additionally has its own multi-mode filter and feedback loop, plus three envelope types: DX7, DADSR and multi-segment. Two modulation envelopes, an advanced modulation matrix, step sequencer, arpeggiator, two LFOs each with six waveforms, 32-voice polyphony, four unison voices with detune and four simultaneous effects configurable in series or parallel take DX7 V’s capabilities far beyond those of the original instrument. It’s also fully compatible with patches imported from the DX7 (via SysEx), and naturally includes those quintessential DX7 factory RAM and ROM cartridge presets. Costing as much as a modest house in its heyday, the Fairlight CMI kicked off the sampling revolution in 1979, and now lives on in this rather more affordable incarnation of the Series IIx. CMI V couldn’t be considered a virtual Fairlight without the sounds that made it famous, and Arturia have obliged by providing 600 sounds from the original CMI library — no Winchester floppy drive required! The CMI’s sampling and additive synthesis are joined by a new sound generation mode: Spectral Synthesis. 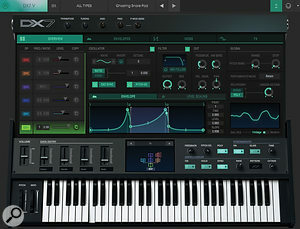 User samples can be imported and even resynthesised in the additive synthesis domain to create new sounds whose harmonics can be controlled over time. 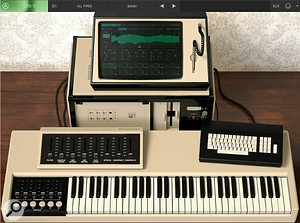 The 32-step sequencer is an enhanced version of the Fairlight’s infamous Page R, having 10 tracks, each with its own sound. Eight step-sequencer patterns can be chained together, each with its own swing settings and length. The 10 parts can also be sequenced externally on separate MIDI channels, each with a maximum polyphony of 32 notes. One for semi-modular synthesis fans, Easel V is a component-level model of the rare 1973 Buchla Music Easel, the machine said to have defined West Coast synthesis. In many ways California’s answer to the VCS3, Easel V is more to do with avant-garde sound design than being a ‘performance’ keyboard instrument. Its complex architecture of oscillators, filters, gates, clock, pulser, 32-step sequencer and countless modulation possibilities leads more often than not to serendipitous results and unique sonic textures. Subtractive, AM and FM synthesis are all possible, and the virtual patch-cabling system ensures that no ‘illegal’ connections can be made. Arturia’s innovative Gravity modulation, 256 presets, four-voice polyphony, two serial effects slots and a choice of 10 effects give Easel V the 21st-century touch. Although keeping a virtual Clavinet in tune is clearly not going to be an issue, one factor that certainly contributed to the roadworthiness of the D6 was its stability of tuning. Until the D6 came along, the tuning mechanism of all previous models utilised wrest pins — conical tuning pegs similar to those of a violin, that relied on friction to keep them in position. For a brief period I owned a Clavinet II that needed constant retuning, even though it never left the house. Precise tuning was a tricky business too; the pegs would often seize tight, and strings would always tend to slip past the target pitch. That all changed when the D6 abandoned wrest pins in favour of guitar-style geared machine heads. It’s no word of a lie to say that in five years of touring Europe and the US, my ‘road’ D6 never needed retuning. Extremely accurate recreation of a Clavinet D6. 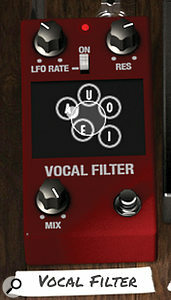 The choice of effects is very appropriate to the instrument. No samples, so near-instantaneous loading time. Mute slider correctly models progressive damping. No LFO or delay-time tempo-sync’ing for the effects. No bypass switch for the foot pedal Wah. There are some very good sample-based Clavinets out there, but this is the one that makes me want to play it for hours. Clavinet V €199, V Collection 6 €499. Prices include VAT. Source Distribution +44 (0)20 8962 5080. Clavinet V $199, V Collection 6 $499.